Does the intervention cause the heart to become hypereffective or hypoeffective, or does the intervention have no effect? Does the intervention cause the mean systemic filling pressure to increase or decrease, or does the intervention have no effect? 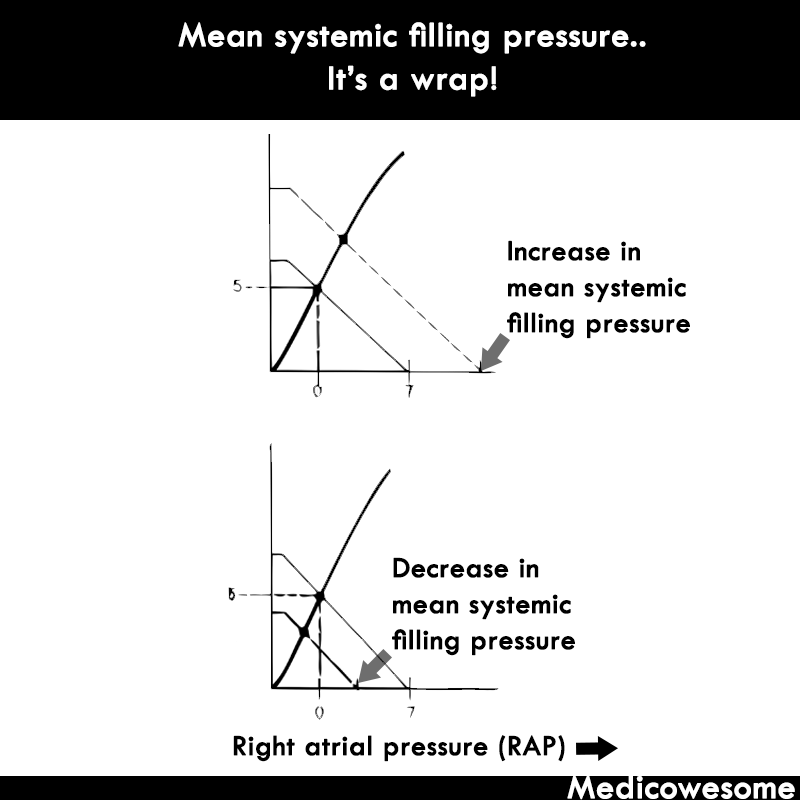 Mean systemic filling pressure - It's a RAP, get it? Right Atrial Pressure!? Hahaha! Does the intervention cause the resistance to venous return to increase or decrease or does the intervention have no effect? 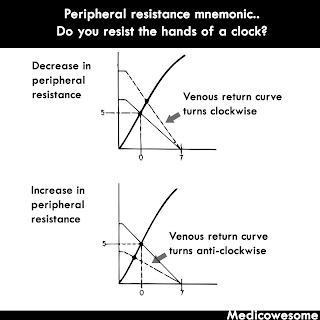 Peripheral resistance mnemonic.. Tick, tock, it's a clock! Mnemonic: I remember that normally the hands of a clock go clockwise. So if the hands of a clock have to go anticlockwise, there'll be resistance to do so. Therefore, anticlockwise turn of the curve means increased resistance! For example, say, a patient has hemorrhage. 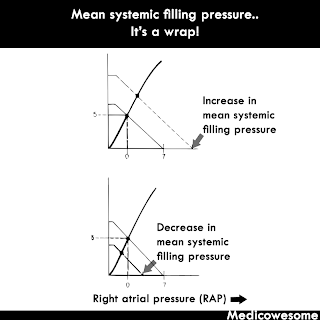 Mean systemic filling pressure will decrease due to blood loss, total peripheral resistance will increase due to reflex vasoconstriction and the heart is hypereffective (pumping harder to compensate). Note that the cardiac output curve and cardiac output are not the same thing. 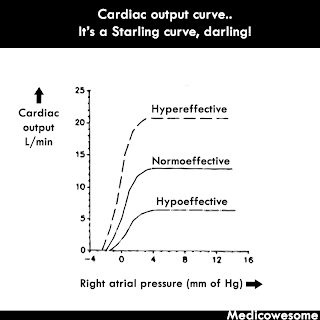 Cardiac output (The point where the two curves intersect) will decrease. 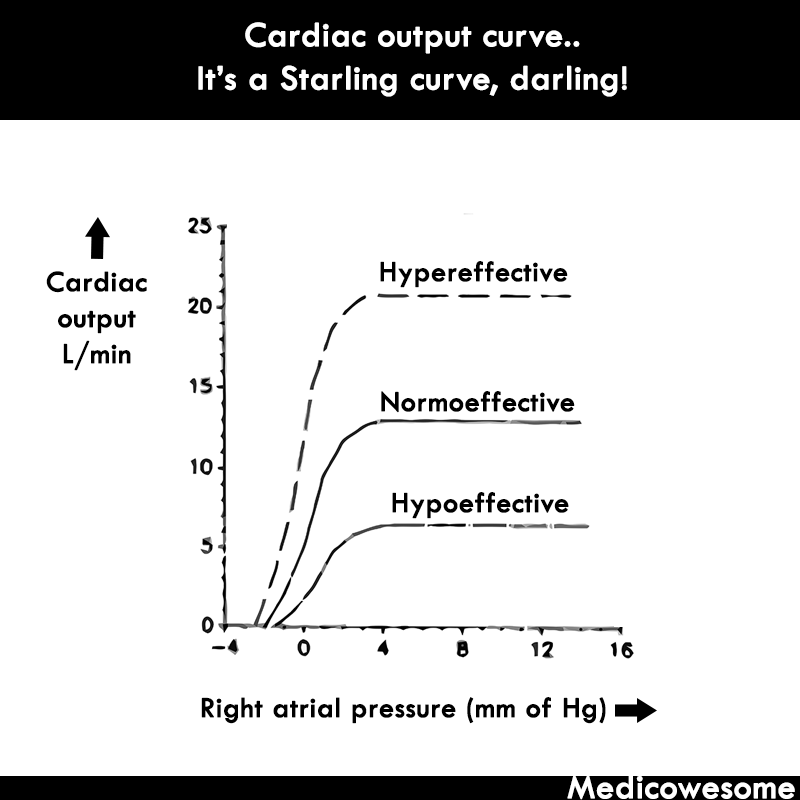 However, the cardiac output curve will show an increase in inotrophy of the heart. You can make your own examples and draw the curves yourself! Hey! Thanks for this post. I don't understand the clockwise, anti clockwise thing though. Isn't venous return supposed to decrease when TPR increases? I think you can't read the graph properly. The curve and the values they represent are different. 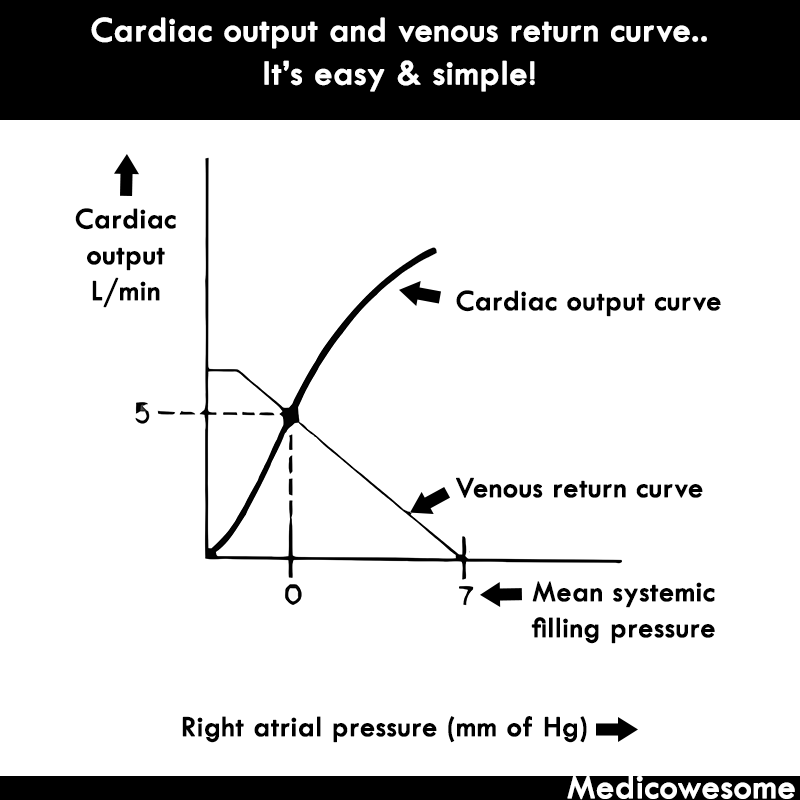 When TPR increases, the venous return curve goes anticlockwise. The TPR is represented by the "angle" the venous return curve makes with the Right Atrial Pressure line. 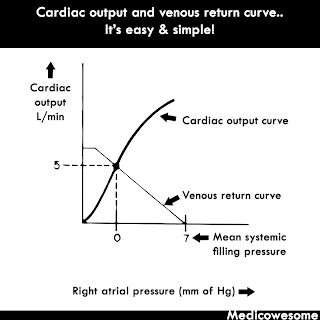 Venous return is where the venous return curve touches the Cardiac Output line. 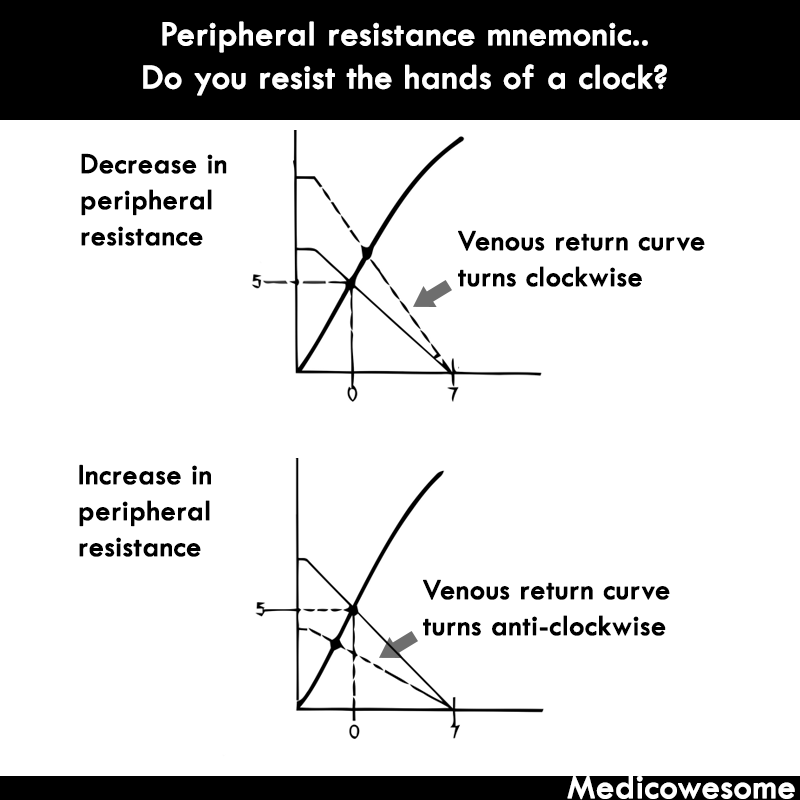 So when TPR increases, Venous return decreases, just like you said. i thought we said as TPR increases, Mean Systemic Filling pressure increases, and thus "the easier it is to push blood back into the heart"... thus, venous return would increase?? So I don't know if this makes sense, but lemme try explaining it. "The greater the MSFP the easier it is to push blood back into the heart." What I really mean is - "When venous tone increases, MSFP increases, which increases venous return." The fraction of the blood volume located within the arterioles is very small, whereas the blood volume in the veins is large. Thus, changes in peripheral resistance (arteriolar tone) have no significant effect on MSFP, but changes in venous tone can alter MSFP appreciably. 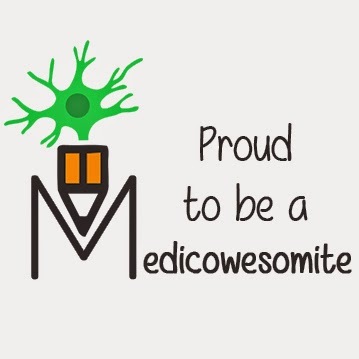 Hence, MSFP rises with increased venomotor tone and falls with diminished venomotor tone. So, venous constriction makes it easier to push the blood back into the heart. "Increase in peripheral resistance decreases venous return." Lastly, you said TPR increase would increase MSFP.That's not true! What does the intersection point of cardiac output curve and venous return curve denote? When the cardiac and vascular function curves are plotted together on the same graph coordinates, there is an intersect between the two curves. This crossing point of the two curves simply represents the steady-state operating point that helps us define the the cardiac output and right atrial pressure for that particular condition. In this example, the CO is 5 L/min at a RAP of 0 mmHg. The point itself doesn't denote anything as per my knowledge, but then again, I could be wrong.